The Expat: Where are you from originally? Geoff Walker: I was born and raised in Chicago, Illinois, the third largest city in the US. My late father was a professional pianist and composer who wrote thousands of jingles for every type of product and service imaginable over the course of his career. My mother was born in Brisbane, Australia. She and my father met and married there towards the end of WWII, at which point she emigrated to the States and became a naturalised citizen. When I was eight, my parents bought the first house designed by Frank Lloyd Wright, America’s most famous architect. Growing up in the Winslow House, as it is called, was akin to growing up in a museum. Thousands of people came from all over the world to see it every year. My mother still lives there. The Expat: You became interested in Borneo at an early age by reading books about it. Which books were those? What did you imagine Borneo would be like at that time, and how is it different in reality? GW: I first read about Borneo when I was seven or eight. The books I read—Bring ’Em Back Alive and On Jungle Trails—were written by Frank Buck, a world-famous collector of wild animals for zoos in the early 1900s who spent much of his time in Borneo and other parts of Southeast Asia. When I first came to Borneo seven years ago, I didn’t expect that it would bear much resemblance to the country Buck described in relating his adventures of 80 years earlier. And of course there is a great deal of difference. However, I had the opportunity to travel a bit around the interior of Sabah and to experience a taste of life in some fairly remote kampongs as well as virgin rainforest and that almost made me feel as if I were seeing it through Buck’s eyes. The Expat: What is your life like as an expat in Kota Kinabalu? GW: There are many things I truly enjoy about living here in Kota Kinabalu. The weather is ideal (if you don’t mind a lot of rain, which I don’t), the scenery lush and exotic, and the people the friendliest I have met anywhere in the world. I get frustrated at times by the inadequacies of the infrastructure but it’s a relatively small price to pay in exchange for an interesting lifestyle. Many locals with whom I have made friends over the years have expressed amazement that I could so easily pull up stakes in America and move to an alien environment, but the challenge of adapting to life here has been rewarding. For one thing, I would never have written The Bomoh’s Apprentice if I hadn’t lived here. The Expat: Why did you decide to write The Bomoh’s Apprentice? GW: Writing a novel and seeing it published has always been one of my main ambitions. I actually wrote a book before this one (a novel very roughly based on my college years) but was told by an editor who was kind enough to slog through the 500,000-word manuscript that it was too long by two-thirds to stand a chance of being published. 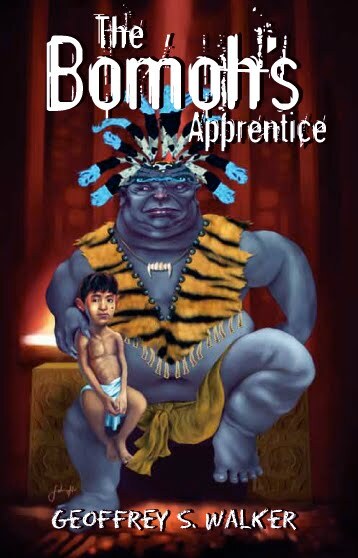 The Bomoh’s Apprentice started out in my mind as a very different story: different plot, different principal and subordinate characters, even a different title. After I had written about 100 pages, I realised that I needed to break the story down into separate, discrete chunks before I repeated the problem I had with my first novel and wrote to an unpublishable length. The Expat: Without giving too much away, what is the story about? GW: The Bomoh’s Apprentice is essentially a “rite-of-passage” story that focuses on the early years of a boy who was orphaned at the age of three and adopted by the bomoh of the kampong in which he was born. The first part of the book takes him through the age of 16 and touches on various experiences that shape his life and personality. Part two covers the next year of his life, which begins with a disaster that seems to destroy all future hope of his fulfilling his destiny. The Expat: What exactly is a bomoh? GW: A bomoh is the the Malaysian equivalent of a sorcerer or witch-doctor. I have met and spoken with a few by way of gathering input for the book I’m working on now, the first sequel to The Bomoh’s Apprentice. I am not superstitious by nature, but I don’t doubt that these fellows are capable of doing some fairly amazing things. In any event, I thoroughly enjoy the concept of magic and supernatural powers and enjoyed the license it gave me in constructing my plot. I don’t make any claim that what I have written is “authentic”, “realistic” or “accurate” where real bomohs are concerned. The Bomoh’s Apprentice is a fantasy, not an anthropological study. And whereas I did sincerely wish to capture the essence of an alien culture (alien to me, I mean, of course) my chief goal was to write an entertaining story.